Definition at line 2775 of file DeclCXX.h. Definition at line 2823 of file DeclCXX.h. Definition at line 2824 of file DeclCXX.h. Definition at line 2513 of file DeclCXX.cpp. References clang::C, clang::DeclarationName::CXXConversionFunctionName, clang::DeclarationNameInfo::getName(), and clang::DeclarationName::getNameKind(). Definition at line 2505 of file DeclCXX.cpp. Definition at line 2815 of file DeclCXX.h. Definition at line 2818 of file DeclCXX.h. Definition at line 2807 of file DeclCXX.h. Referenced by compareConversionFunctions(), clang::Sema::DeduceTemplateArguments(), diagnoseAmbiguousConversion(), diagnoseNoViableConversion(), clang::OverloadCandidate::getNumParams(), clang::Sema::PerformContextualImplicitConversion(), and recordConversion(). Definition at line 2802 of file DeclCXX.h. 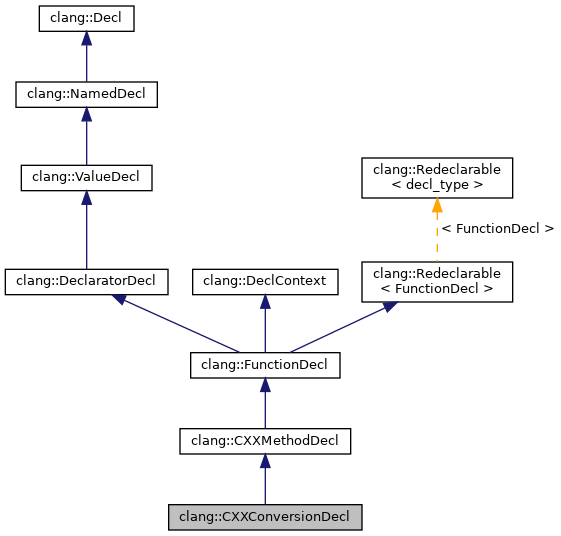 Determine whether this conversion function is a conversion from a lambda closure type to a block pointer. Definition at line 2527 of file DeclCXX.cpp. Definition at line 2789 of file DeclCXX.h. Definition at line 2790 of file DeclCXX.h.